World Rookie Fest will be proudly supported by the Air & Style this year again. 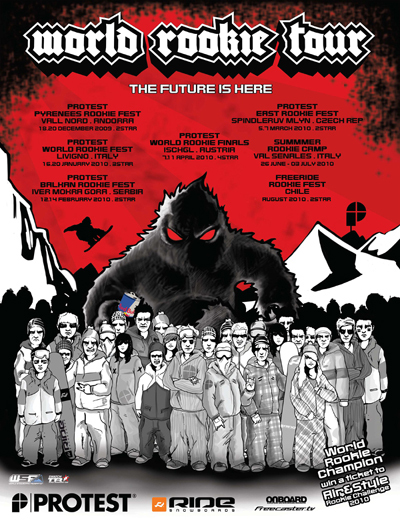 The World Rookie Champion 2010, who will nominated during the Protest World Rookie Fest at Ischl, Austria, April 7-11 2010 will win a wild card to the Air & Style Rookie Challenge 2010. There are only few days to go for the Billabong Air & Style 09/II on 05.12.09 (www.air-style.com) and the big news is that the Air & Style Rookie Challenge is back again and some of the World Rookie Champions of the past years will take part: Christian Haller (World Rookie Champion 2006), Sergey Lapushkin (World Rookie Champion 2007) and Gjermund Braaten (World Rookie Champion 2008). Many other rising stars as Seppe Smits, Niki Korpela, Kevin Backstrom, who already attended the World Rookie Fest in the past, will be at the start as well. for the World Rookie Champion: a filming session with Pirate Movie Production, an international photo shooting, a freeride trip to Chile and a ticket to Billabong Air&Style Rookie Challenge 2010.
the winners from Livigno, Ischgl and the number 1 of the World Rookie Rank will win an all-inclusive trip to the “Freeride Rookie Fest 2010” in Chile to live a one in a lifetime freeride filming experience with international RedBull pros. Before every event many other amazing prizes will be announced, which will support the career of the best rookies who wish to become professional riders. WSF is the only international organisation working uniquely to develop and support snowboard at all levels, including competitions and education, disable and adaptive snowboarding, activities for riders of any age. WSF is a network of national snowboard associations cooperating worldwide for the development and promotion of the sport. Members find in WSF a source of inspiration and support to their activities. WSF can create added value for everybody involved in snowboard on national level and offers ideas, handbooks and initiatives, the result of an organization whose components share the same goal: progression of snowboarding at all levels. Founded by Terje Haakonsen and industry innovators in 2002, the Swatch TTR World Snowboard Tour is a non-profit, rider-driven organization with the mission to create the highest quality competitive snowboard environment in the world, using authenticity, accessibility, innovation as guiding principles. Since its foundation, the Swatch TTR Tour has been developing into the most popular snowboard tour worldwide featuring global grass root and key independent freestyle snowboarding events over a ten-month period from Southern to Northern Hemisphere locations. The top male and female rider based on an average of their best seven results of the season is crowned Swatch TTR World Snowboard Tour Champion.